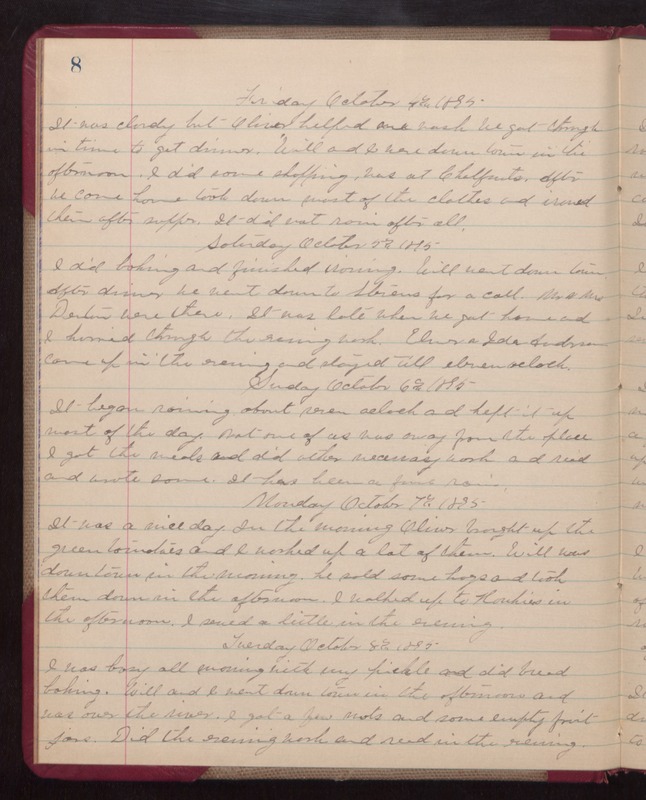 Friday October 4th 1895 It was cloudy but Oliver helped me wash. We got through in time to get dinner. Will and I went down town in the afternoon. I did some shopping. Was at [Chalforts?]. After we came home took down most of the clothes and ironed them after supper. It did not rain after all. Saturday October 5th 1895 I did baking and finished ironing. Will went down town. After dinner we went down to [Sterns?] for a call. Mr. & Mrs. Denton were there. It was late when we got home and I hurried through the evening wash. Elmer & Ida Andrews came up in the evening and stayed till eleven oclock. Sunday October 6th 1895 It began raining about seven oclock and kept it up most of the day. Not one of us was away from the place I got the meals and did other necessary work and read and wrote some. It has been a fine rain. Monday October 7th 1985 It was a nice day. In the morning Oliver brought up the green tomatoes and I worked up a lot of them. Will was down town in the morning. He sold some hogs and took them down in the afternoon. I walked up to Hawkins in the afternoon. I sewed a little in the evening. Tuesday October 8th 1895 I was busy all morning with my pickle and did bread baking. Will and I went down town in the afternoon and was over the river. I got a few nuts and some empty fruit jars. Did the evening work and read in the evening.